This tool is used to convert from the .tmd format supported by JPOG into an asset interchange format, which can then be modified in a 3D graphics tool and merged back with the original .tmd file to create a modified model for use in-game. I'd like to emphasize that this is a very early release, and almost certainly has problems. I'm open to suggestions for future features, however keep in mind that there are some limitations to the engine and format the cannot be overcome; I'll do my best to explain any such limitation as I encounter them. Most pieces have a full IO layer, but levels of detail and animations rely on magic numbers gathered from a template .tmd file. Export a '.tmd' file from JPOG as a Collada '.dae' using this tool. Please note that currently this tool doesn't regenerate the levels of detail for these models, so they are more performance heavy. I distribute binaries through JFrog's Bintray. Current binary releases can be found on GitHub; they'll require the 64 bit Java Runtime Environment and Windows. Source code can also be found on GitHub; it'll require an adventurous programmer to compile. To use this tool you need to install a Java Runtime Environment and set the JAVA_HOME environmental variable to the installation directory. If you have any problems please report them with a private message. Open a file manager and determine where you installed the JRE or JDK. It should be around "C:/Program Files/Java/jre1.8.0_112" and contain the folders "bin", "lib", and other things. Set the variable name to "JAVA_HOME"
Set the variable value to the directory found in (1). Also, if you have any suggestions for features, user interface tweaks, or bugs feel free to either drop me a PM, leave a response on this thread, or submit an issue on GitHub. I too cannot figure out how to get this thing to work, I have no experience with Java, possibly some tutorial to get this to work for those that don't know how to work Java would be good? Sorry about that; I didn't remember that JAVA_HOME isn't set by default when you install a JRE/JDK. I've added directions to do so in the main post. That got things up and running . However, when I try to export a model to ".dae" I get an extremely long error message, this. Sorry about that; when I packaged the files for installation I screwed something up. I released 0.0.2-alpha that fixes this; and makes the error messages more readable. Do you have the .tkl files in the same folder as you're loading the model from? This is incredible ! You have discovered the holy grail of JPOG; I must try this out soon. Okay I've moved packaging of the binary to OneJar, and dug out another computer to test on. Version 0.0.3-alpha shouldn't have any basic errors now. Sorry about all the trouble; I haven't released a JAR that needed natives in a long time. I'm getting the same error as jaml655 whenever I attempt to merge a .dae and a .tmd file, even if there are no edits made, even in the newest version. Yeah, it seems there is an issue with onejar unpacking the natives. I'm looking into it. Yeah there was an issue with dependent libraries. My other computer already had the dependency installed so I didn't catch it. I've released v0.0.4, which is even more likely to work than the previous releases. There are still some issues in the assimp library, which cause intermittent crashes. They don't seem associated with a particular file so if this crash does occur just try again. I get this error message when attempting to merge the .dae file with the .tmd file (here it is a Spino_hi.tmd renamed Bary.tmd). It occurs with both unmodified and modified .dae files. java.lang.UnsupportedOperationException: This basis file, Bary, was divided due to its skeletal complexity. This program doesn't support exporting to this format yet. EDIT: in addition, I am unable to apply the textures onto the model. Probably has to do with my inexperience in Blender . . .
Yeah sorry about that. That's a know limitation currently. Some files (the larger carnivores) primarily, have a large number of bones in the armature and were split into multiple mesh "pieces" to ease the load on the game engine. When I export to DAE I merge these pieces together, since if I don't editing them would be really hard. I haven't yet written something to re-split the meshes; it's on the TODO list. Try a smaller dinosaur. Regarding textures: This tool doesn't export them yet, so you'll have to rip them from the .tml files yourself (another thing on the list is to make this easier). Then you can associate the texture to the precreated texture node in Blender. Edit: I've written the IO layer for the TML files; I'll see about integrating it in the next couple days. Also, here's the first actually useful model made with this tool (that I know of). A smallish Therizinosaurus based on the Gallimimus. Features include a higher triangle count, and open assets. From Blender to JPOG. Assets are here, in a zip file containing the PNG and XCF (GIMP) format texture, the blender project file, the UV layout, and the compiled model file "Galli.tmd", and the partner material library "dinos_flamingcliffs.tml" generated by this tool. There should be a timeline at the bottom in blender, along with play pause buttons. Drop into object mode and that should work. I'll try to add in full texture support today. Whoo, thanks for the prompt reply! I mucked around in Blender a bit and got the skin to display. However I have the same issue as jaml655 in that the exported tmd file doesn't display a skin in game. When opened in a hex editor, the strings that dictate which skin the model should use are simply missing. Any help would be appreciated -- I'm definitely missing something obvious, as your models clearly have skins in game. EDIT: A quick model I did to familiarize myself with the basics of Blender. This tool really opens up a lot of options. I just released v0.0.5-alpha; it includes a fancier UI with support for managing material libraries. The merge pipeline currently imports the texture names from the *.dae file, without updating the material libraries to include the textures. The Therizinosaurus I made used some little tricks, and some of the code included the pre-release I just released that allows material library editing. If you add a material to the corresponding library with the proper name you could get it working; however I'd suggest waiting for the next release to import the textures into JPOG. The next release (0.0.6) is currently planned to include full automation of the texture import and export pipeline in the model merging pipeline. At that point I would consider the tool "feature complete," and the remaining updates will probably focus on making it work for the large carnivores that use multi-piece models. If you really want to get the material integrated with the current version you can look at this bit of code and see that the material name used in JPOG is the texture name from blender, minus the "_0" at the end. So if use a blender texture named "Galli_0" then the corresponding JPOG material will be "Galli". 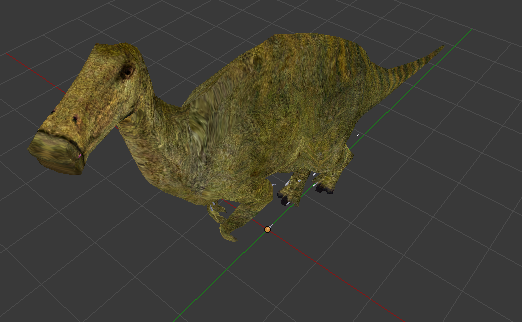 Since the Gallimimus is part of the Flaming Cliffs formation you can open the material library "dinos_flamingcliffs.tml" inside the material library editor, select the "Galli" material, select the alive texture, then import the new texture and save the material library. Another note: feel free to use Blender's subdivide tool in edit mode, or a subdivision surface modifier that you apply in Object mode to give you more vertices to work with when you want to deform the model. I'm aware that this program currently has quite a few limitations, however as the author I don't have the best idea of how to make the UI efficient and easy to use. If you have suggestions or grievances with the current UI (or program in general) please drop me a PM, open an issue on GitHub, or post in this topic. I'd really like some feedback on how this tool's UI could be improved, as user experience stuff isn't my forté. UI wise, I think there should be an option to bookmark certain folders for quick access. I'm guessing scaling models up and down isn't supported as of yet? I'll try to come up with a way to improve the folder and file access scheme. I'm probably going to change the UI to use the default (operating system) file browser instead of the Java one. Global scaling requires modifying the underlying armature of the models, which in some cases also requires modifying the underlying animation data. Currently I'm focusing on the pipeline that allows users to edit the underlying mesh -- through blender -- and global scaling (and local bone scaling) can't really be part of that pipeline. Currently the underlying input/output layer supports all the necessary operations to do these; I just haven't worked on a UI yet. Also, mainly just a notice: I'm going to be busy with other stuff for awhile now (break is over) and I no longer will be putting out releases every other day. I'll try to strive to get something done each week, but who knows if that will happen. IMO Blender displays the model pretty much as it appears in game. It shouldn't be necessary. Hey, I have Windows XP, do you think it will do?